DreamWorks Animation Studios should be a case-study examination on the rise and fall of a once proud company. Producing their first film back in 1998 with Antz, DreamWorks slowly became a force to reckon with a string of successful features, including Shrek, Madagascar, Kung Fu Panda, and How to Train Your Dragon. At its height, the studio was at the top of its game, being one of the top tier animation studios out there, jostling for the #1 position with upcoming rival studio Pixar Animation studios. Unfortunately, the company has faced hard times (changes over distribution and company ownership), cutting jobs within and producing two movies a year instead of three. Even with popular recent hits like How to Train Your Dragon 2 and Kung Fu Panda 3, their animated the feature films themselves have become less-than desirable, with mediocre hits like Turbo, Home, and Rise of the Guardians, which either faced poor reviews by fans / critics or underperformed in box office projections. And now, with Disney back on the scene (producing more favorable hits) as well other animated studios, it seems DreamWorks the “old dinosaur” of animated world. With the success of their first 2016 film (Kung Fu Panda 3), DreamWorks now prepares (hopes) for another hit with their new movie Trolls. Does this latest cartoon endeavor find its charm and box office success or its another misfire from DreamWorks? 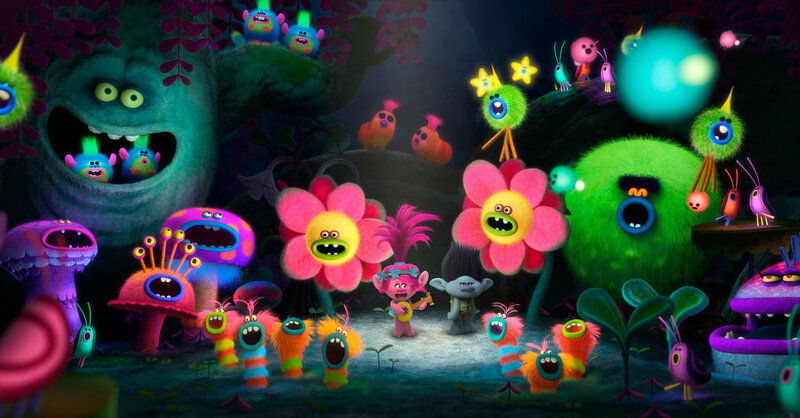 Deep within a magical land, the Trolls are tiny, colorful animated creatures who live to spread joy, give hugs, and sing songs throughout their community. In contrast, the Bergens are large, ugly-looking monsters who can’t quite achieve joy on their own, needing to consume Trolls in an attempt to digest their sugary goodness to achieve their moment of happiness. On the eve of Prince Gristle (Christopher Mintz-Plasse) receiving his first bite of Troll, prepared by Chef (Christine Baranski), the imprisoned Trolls perform a major escape from the clutches of Bergens. Twenty years later, Princess Poppy (Anna Kendrick) is preparing celebrate the anniversary of the Troll’s great escape from the Bergens, making a celebratory ruckus while Branch (Justin Timberlake) warns her about attracting unwanted attention from the boisterous festivities. Meanwhile, Chef, blamed and exiled for losing the Trolls twenty year ago, emerges, spying on the celebration, and snatches up a handful of Trolls to bring back to Gristle (now King Gristle) in an attempt to redeem herself. Determined to save her fellow Trolls, Poppy ventures forth, crossing the land and pulling the “Debbie Downer” Branch into the mission. The pair hits the road, learning more about each other as they encounter survival challenges, making their way to Bergen Town. As I said above, DreamWorks Animation is a cautionary tale of sorts of how a once popular animation company is in the decline. I loved them when they first came out, with films like The Road to El Dorado, Sinbad: Legend of the Seven Seas, and Shrek being my first introduction to the studio. From there, the studio produced some favorable hits, which turned into some animated franchises, including Madagascar, How to Train Your Dragon, and Kung Fu Panda. However, the overall “dreams” of DreamWorks has vanished as their films have been up to par of late in my personal opinion, with the studio creating several mediocre animated tales and so poorly, short-lived cartoon series of their products. Thus, my taste in DreamWorks Animation Studios has wavered as now look towards other animation studios for some favorable hits. This, of course, brings me to the present with DreamWorks Animation’s newest film Trolls. Coming off the success of Kung Fu Panda 3, a film, which I loved, my expectations were slightly elevated and the film’s trailer, which I’ve seen many, many times throughout my travels to the movie theaters this year, proved that Trolls had the potential to be a fun kid’s movie. After seeing it, I felt that Trolls, while not exactly a hard-hitting feature, is a step in the right direction for the studio. Wasn’t absolutely great, but, with colorful animation, catchy tunes, and solid voice work, it made the feature enjoyable. Trolls is directed by duo directors Mike Mitchell and Walt Dohrn. Overall the pair bring their previous knowledge of cartoon / kids’ projects to Trolls, providing the right mixture of approachable material as well as animated silliness. Speaking of silly, the film’s humor is more gear towards the young crowd (as is the entire film). Thus, most kids will find the movie funny as some adults might even give a good chuckle here and there. For the most part, the film, much like the Trolls themselves, the film is light and colorful. The animation style is also interesting and pleasing to the eye. Colors are extremely bright and vibrant and the film as interesting style of animation that has a more “felt” (the fabric material) in its presentation, which definitely makes the film standout against the classic CG animated nowadays. The actual design of a lot of the film’s characters are quite interesting as well as creative from the small, plucky Trolls to the big monstrous but still kid friendly Bergens and every other creature in between. The film’s numerous music songs are also quite catchy, a combination of original songs and popular (or at least recognizable) hits from music’s history past. Some might argue that the film uses too much songs, but I personally didn’t mind as it added the overall enjoyment of the feature. The message in Trolls is also a poignant one. While it’s not complex or sophisticated like Finding Dory or Zootopia, Trolls centers around the ideas of finding your own personal happiness, overcoming hardships to accomplish goals, and (of course) the always universal one of “being yourself”. Like said, while these are important moral / lessons to learn, Trolls doesn’t go beyond it surface level to present these messages (nothing deep like Inside Out), but, given the movie’s overall lightheartedness, its effective in its deliver to its youthful viewers, elevating the film’s final product (depending on where you personally stand on it). The problem with Trolls is that it’s trying to be like 2014’s The LEGO Movie, a film that’s based on a popular toy line product. In a similar fashion, Trolls wants to capitalize on that notion, crafting on feature film that’s based on a well-established toy line, but Trolls, which is based on the Good Luck Trolls dolls, feel a bit dated as the dolls themselves aren’t quite as popular as they used to be. I remember them growing up, but they faded from popularity around the early / mid 90s (at least to me). Thus, Trolls seeks to resurrect the interest in the Troll dolls, but I don’t think that’s going to happen. As for the film, itself, the movie isn’t as well-rounded as The LEGO Movie. Directors Mitchell and Dohrn know their targets audience, which is the younger crowd of children (an age range of 5 to 8), and while Trolls hits its demographic, there isn’t much left for everyone else. I know animated movies have become more popular with adults, especially with this year seeing Zootopia, Kubo and the Two Strings, and Moana (I’m future forecasting here), but Trolls doesn’t have much to offer to anyone beyond the “juice box” crowd. It’s a straightforward kid’s movie that light and pleasant, but doesn’t offer that much in sophistication nor does it resonate as strong as other recent kids’ movies of 2016. In addition, the film’s narrative is a bit a thin, with a rescue mission setup that has the classic of traits of self-discovery and empowerment (all well and good), but then adds a side “Cinderella-esque” story into the mix, which doesn’t help strengthen the narrative. Personally, I’m still a bit confused on Chef’s ultimate endgame plan? Lastly, the film has too many side characters. I’ll explain more on that down below. Like a lot of animated movies, Trolls enlists a collective group of well-known actors and actresses to lend their voices to bring these cartoon characters to life. Leading the charge are the two films main character of Poppy and Branch, voiced by Anna Kendrick and Justin Timberlake. Both Kendrick and Timberlake are definitely a highlight of the feature (at least to me), bringing their natural charisma to their respective characters, which really does work will. Kendrick’s Poppy is perky and upbeat sounding, while Timberlake’s Branch is more pessimistic and sarcastic. Both also have great chemistry with each other (Poppy and Branch play off one another as the atypical “odd couple”) and it also helps that both Kendrick and Timberlake can sing naturally, making all their lyrical moments very pleasing to watch (or rather hear). Of the supporting cast, three characters are given enough time to be highlighted in the feature and, while film’s script prevents them to be elevated to wholesome supporting players, the voice work behind them the most of the material that is given to them. This includes Christine Baranski’s Chef, the film’s villainous baddie antagonist of the feature, Christopher Mintz-Plasse’s Gristle, the young adolescent sympathetic king of the Bergens, and Zooey Deschanel as a kind-hearted, but lonesome scullery maid who has a secret crush of Gristle. As I said, each one as their moment in the spotlight and are voiced well, but are a tad familiar in their respective characteristic and personas. The rest of the cast does good work filling in (voicing) the rest of the characters in Trolls, but their roles are small and not as impactful, acting more like stock / background characters. Most of these (if not all) are Troll characters, including Russell Brand as the spiritual enlightened Troll Creek, James Corden as the big Troll Biggie, Jefferey Tambor as the Troll King Peppy, Kunal Nayyar as the sparkly Troll Guy Diamond, Gwen Stefani as the Troll DJ Suki, Ron Funches as the giraffe-like Troll Cooper, and Caroline Hjelt and Aino Jawo (the two members that make up the musical group of Icona Pop) are the two fashion-styled Trolls Chenille and Satin. 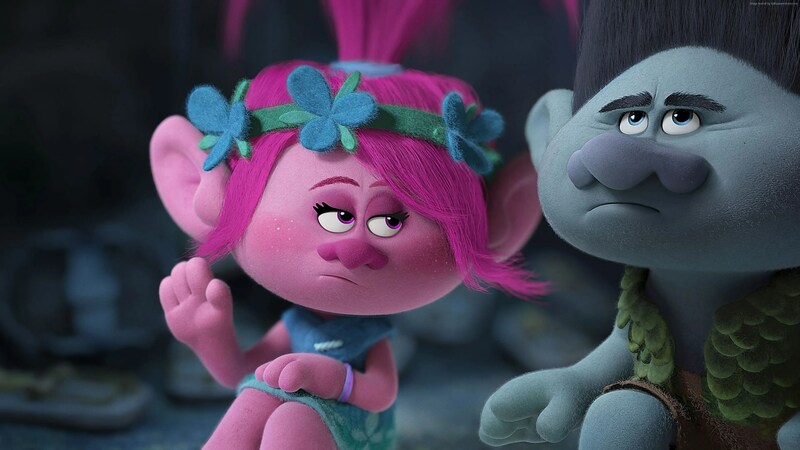 Again, while the provided voices are solid, there characters are pretty forgetful and are just window dressing for this animated feature as I reiterate that Trolls had too many supporting characters. Discover the colorful and zany world of Trolls and Bergens in the animated film Trolls. Director Mike Mitchell and Walt Dohrn latest cartoon feature for DreamWorks has plenty of joy and happiness to go around, displaying vibrant palette of animation, solid voice cast, and always poignant thematic message for kids to learn. To me, it was good. It wasn’t the best DreamWorks movie (it did have some problems with its narrative and some cartoon nuances) but it was better than some of its more recent endeavors, with the exception of How Train Your Dragon 2 or Kung Fu Panda 3 (what I can say…I love those two movies. Better yet, I love those two franchise.). Thus, I would say that this movie as my recommended stamp of approval, definitely worth seeing if you have kids, who will probably fall in love with this movie, even if you don’t. For what it’s worth, Trolls may not be the animated movie to completely rejuvenate DreamWorks Animation in its attempt to reclaim its dominance in cartoon motion pictures (let alone be the best animated movie of 2016), but it’s a step in the right direction and you’ll find a joyous (happy) time in this breezy and colorful sing-along adventure with Poppy and Branch. Hey there! Yeah, it is more geared towards younger kids, but it doesn’t mean that its not enjoyable. Its not going to be accessible that much to adults like Zootopia, Inside Out, or Kubo. Haha no absolutely not! I might give it a chance! Didn’t get a chance to see this yet, Was requested to write a review on it so I shared yours :). Great work! Thanks! And thanks for sharing mind! I feel honored!